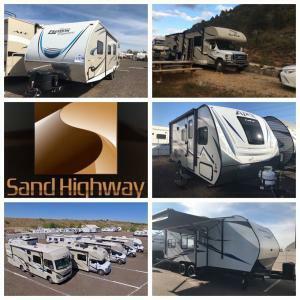 Sand Highway RV Rentals LLC has been serving the Phoenix area, including Scottsdale, Mesa, and beyond, with high-quality RV, trailer, and ATV rentals since 2013. Our nearly all-inclusive rental experience is like no other, ensuring you leave the lot with everything you need to fully enjoy your trip. Adventurous Employee Network Members who seek freedom from the constraints of life will get 15% off RV rentals + receive the VIP package ($99 value) for Free. Thrill-seeking Members get 15% off Offroad Vehicle rentals. Honey-doers get 15% off Utility Trailer rentals. Discreetly enter the launch Code: EMPNET to arm the fully-digital control panel for instant activation (online bookings) or advise our Lion Taming agent of your Employee Network status. Whether you are planning a local camping trip to a popular destination near Phoenix, Arizona or an extended trip across our beautiful country, Sand Highway RV wants to help get you on the road hassle-free with excellent equipment. Don’t just take our word for it; read what customers are saying about their experience with Sand Highway RV.